Do You Want to See the Style Features of the Ford EcoSport? 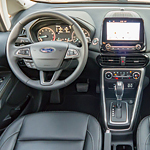 The Ford EcoSport has fun style features that enhance the comfort of this compact crossover. Enjoy the heated seats in the wintertime or on chilly spring or autumn mornings. The driver's seat offers six-way adjustment. The leather trim on all of the seats looks great and wipes clean with ease. When you are taking a drive at night, open up the power moon roof. Your passengers can gaze at the nighttime sky. During the day, you could close the moon roof if the sun is too bright or if you have a sleeping child who does not want the direct sunlight. Visit us at Mullinax Ford of Kissimmee to go on a test drive of the Ford EcoSport. Our associates are also ready to answer any questions you have about this compact crossover.